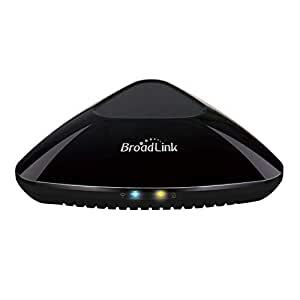 Sold by Broadlink International and Fulfilled by Amazon. Gift-wrap available. 【Compatibility】Support IR (38KHz) controlled devices such as TV, Set-up Box, A/C, Personal Video Recorder, DVD, receiver and RF (433MHz) controlled devices like curtain/shades motor and light switch. Does not work with Bluetooth. 【Voice Control】Compatible with Alexa to voice control your TV/STB; For Air Conditioner, Lamps, Curtain Motor and Fans, you can ask Alexa to turn them on/off. Compatible with Google Home to voice control your Air Conditioner and Lamps only on/off. 【Easy to Learn】Auto match with 80,000+ appliances for most of famous brands and models and increasing IR/RF database everyday on cloud. Support manual learning and create custom remote template. 【Tech Support & Warranty】One-year warranty, 24/7 unlimited technical support and Video Guide are available on YouTube. Please contact us by Amazon Message first if you have any problems with the product, we are happy to help. 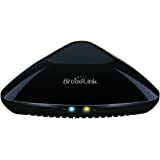 BroadLink RM Pro+ Universal Remote Control is a compact and easy-to-use device that allows you to monitor and control your home's electronic devices from anywhere. Support 80,000+ home appliances, including TV, Set-Top Box, Air-conditioning, Loudspeaker Box, Motor Curtain, wall switch light, etc. No matter IR or RF remote, only one smart phone can control everything. Cloud backup set information, supporting IOS and Android. Upload date to cloud and synchronize original data at new phone with your BroadLink account. You can also back up your own devices and share the control panel with other users. Support iOS 8.0/ Android 4.0 and above. The Wi-Fi name and password shouldn't contain non-ASCII characters. RM Pro+ only support WiFi 2.4GHz 802.11b/g/n, doesn’t support 5GHz. RM Pro+ can control most of IR (38K) and RF (433MHz) remote controlled appliances from your home. That means RM Pro+ can’t control IR remotes with 56K frequency or RF remotes use rolling codes.